True luxury vehicles like the ones found at our Mercedes-Benz dealer serving Orange County, Corona, Moreno Valley, Beaumont, and San Bernardino require a serious commitment to scheduled routine maintenance in order to maintain a high level of performance. It is understandable if you can’t keep track of all the components in your 2016 Mercedes-Benz G-Class that require regular attention and periodical service. Our service experts know everything about these popular sports utility vehicles and the exact service they require in order to keep them going. These 2016 G-Class service intervals will help Mercedes-Benz drivers keep track of when it’s time to schedule a checkup. Bring your 2016 Mercedes-Benz G-Class in to Walter's Mercedes-Benz of Riverside and utilize Service A or Service B plans based on factory recommended schedules for best results. It’s no secret that oil is what keeps the engine in your car running day in and day out. Keeping your oil clean and new is not the only thing that your vehicle requires. Not taking care of it does limit power and efficiency of the engine, but there is a host of other services necessary to keep you on the road. All of the debris and pollutants in the air around Orange County require regular replacement of filters in your Mercedes-Benz. They are specifically designed to keep all the nasty stuff floating around from damaging the components in your vehicle. The more time you spend driving, the faster the filters get clogged, which is why the oil and air filters have to be replaced every four years or 40,000 miles. 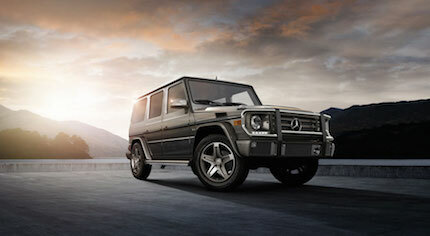 This will really help protect the vital components of your Mercedes-Benz G-Class SUV. A dependable set of brakes is important on the crowded roads of Southern California, and there are few better than the ones you find on a Mercedes-Benz vehicle. This system includes more than just pads, there are calipers, discs and brake fluid, which makes them respond when you need to slow down or stop. This system should be checked every year or every 10,000 miles to ensure you can brake safely. This fluid breaks down over time from the heat, which is why you should have it checked and drained regularly. Those little spark plugs have a big role when it comes to starting your Mercedes-Benz G-Class SUV. They initiate the combustion cycle of your engine. They make that engine roar when you turn the key, but they don’t last forever. Spark plugs should be replaced every six years or 60,000 miles for optimal performance. Waiting too long can make it difficult to get your engine to turn over, which is not something you want to deal with when you’ve got to be somewhere. The fuel filters don’t need to be changed in your Mercedes-Benz G-Class, which is one less thing to worry about. Routine maintenance makes a huge difference in vehicle performance, so get your Mercedes-Benz service near Orange County taken care of at Walter's Mercedes-Benz of Riverside and it’ll be smooth sailing for years to come. To schedule a service appointment, give us a call today at 888-656-5003.